Unable to find on map. Kerr places this town south of Nunkiang in Heilungkiang. I can't locate a town by that name with the maps I have although I can find a town shown as Yung Nan Chen in a similar location. A post office with this name is not found in Fisher. The location may be fictional and the overprint concocted by a dealer (not a unusual practice). 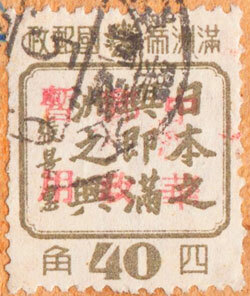 This soft black overprint reads 暫郵中用妀華 China Post Temporary Use Re-valued. 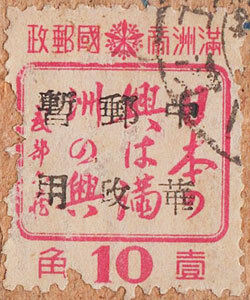 Kerr states that this stamp is only found on covers. Chan lists it as a private overprint. This version of the overprint in red is unlisted by Kerr or Chan.